The topic of becoming a strategic leader arises with more than a few of my clients who have been advised in performance discussions that they need to become ‘more strategic’ in their style of leadership. Typically, they’re in senior functional or operational roles and are being considered for enterprise-level positions. To respond, they need to understand how strategic and operational thinking and action differ. Research by the Center for Creative Leadership shows that organisational success hinges on a compelling vision, tightly-crafted strategies and immaculate execution. Delivering all this requires what Katherine Beatty describes as ‘strategic leadership’ in her book Becoming a Strategic Leader: Your Role in Your Organization’s Enduring Success. Operational leaders meet short-term targets, achieve mastery in one or more functional areas, e.g. finance or marketing or HR, execute strategy, and usually have a focus on productivity. Whereas, strategic leaders look outside and ahead to the longer-term, manage ambiguity, have an enterprise-wide perspective, innovate, effect change and think about organisational sustainability. Strategic leadership is characterised by strategic thinking, strategic acting and strategic influencing as the graphic illustrates. What do we know factually about customers, the market, internal trends, etc? If we changed the lens, would it change the situation? How important is it to the organisation to succeed in doing this? How does this challenge relate to other parts of the organisation? Who are our stakeholders and how will they be affected? Precisely how is my decision aligned with the organisation’s direction? Where are the inconsistencies? Are they material? What unintended consequences may we face? How will we deal with them? What obstacles will prevent us delivering on our decision? How should we anticipate and navigate these obstacles? Are we prepared for failure? How will we learn from the experience? What’s my expectation of the outcome and what will success look like? Who else do I need to enrol to get the job done? How will I inspire them? What stories can I tell to light up my vision and the path to success? What systems and structures need to be changed to succeed? What do I have to make this happen? Who can I recruit to champion my cause? 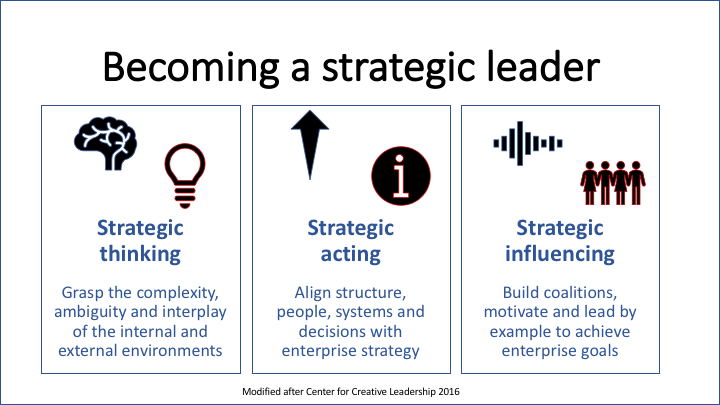 Strategic leadership involves leading your enterprise, your team and yourself. Strategic leaders are needed at all levels of the organisation. Becoming a strategic leader requires you to recognise  While the CEO is the top leader, strategic leaders–as defined here–are needed at all levels,  To be an effective strategic leader, you need your followers to be strategic too in understanding what’s needed and why, and  strategic decision-making is not episodic, it is a pattern of choosing amongst options in a continuous journey of discovery.